The Marvel Now series continues with the transition of Journey in to Mystery with a new creative team and a new protagonist at the helm. Kathryn Immonen has a small back catalogue and is notable for her webcomic and work on Runaways and a Wolverine spin off series with Jubilee. Valerio Schiti drew his first comic in 2010 and has drawn issues for Battle Beasts and Teenage Mutant Ninja Turtles. Both are relatively young to the game and have been given a chance to revamp the JIM title. Kid Loki has been the mainstay of this book since 2010 and it was an angle that was refreshing and enlightening. The book now features Lady Sif who appeared sporadically in that book. She is a great Asgardian warrior who has been appearing in comics since the 60s, and often portrayed as Thor’s lover. 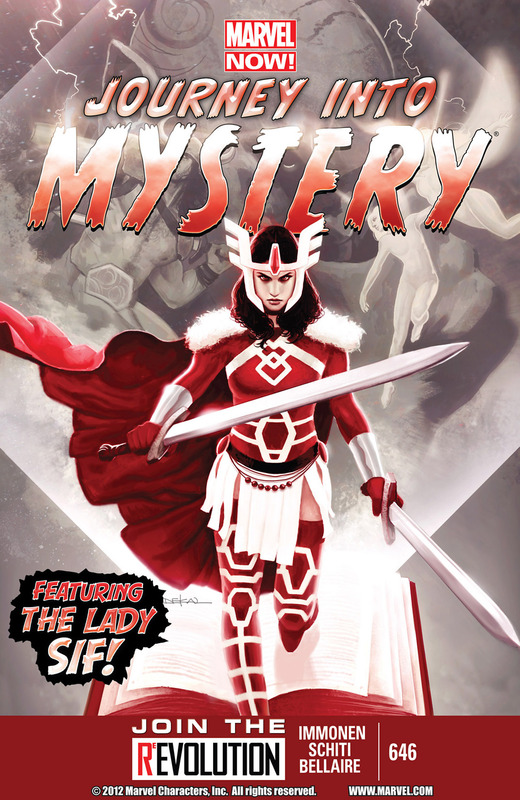 It is a chance for Immonen and Schiti to take the lady Sif on mysterious journeys! The book starts where the Everything Burns storyline ended, with Asgard in flames. Sif rescues a child of the Volstagg clan from the burning library. Once returned there is a fantastic conversation between Sif and Gudrun (wife of Volstagg) revolving around family and Asgard. Therein lies a very natural conversation regarding the futility of building a future in a great city that is constantly attacked and destroyed. In fact a small exchange between Sif and Gudrun’s daughter subtlety displays the importance of diplomacy over arms. These pages highlight the plight of raising children in a city often under siege. The narrative has a good balance between realism, humour, suspense and surprise. The dialogue is simple and kept that way whether Sif speaks to kids, dragons or demons. Schiti’s pencilling is fine and detailed and Lady Sif looks incredible, especially in her uniform. His close ups are simply drawn without over detailing and his action sequences are crisp and clear. There is a great single page spread of Sif taming a mythological creature, which is so pretty and truly shows Sif’s prowess. Towards the end of the book there is an interesting turn in Sif’s character and it is drawn eerily, scarily and coloured just as creepily by Jordie Bellaire. The Lady Sif is a character constantly fighting for Asgard, but she is not its champion. The Odin family is often responsible for the assault on her beloved city but also for the saving of it. Sif wonders whether it has to be this way, whether it always has to be attacked, destroyed and rebuilt. There has to be another way as she is fed up of it. She hears of fallen warriors and magic spells, which can give her power, enough to stop the plight of the Asgardians. It is a classic story of a hard working, God fearing soldier who goes in pursuit of power and finds more than they expected. Sif enters a world of magic and it affects her in ways she was not prepared for. It is similar to kid Loki, who was always scheming for more power but when he got his way, he regretted his actions and effects on others. Sif’s character development has yet to be elicited and I look forward to seeing it, hopefully the journey will be full of twists.and turns. This is an excellent start to an exciting new hero.